Dill, an annual herb that grows to about three feet, is one of the quiet seasonings of Armenian cuisine. It's a subtle yet distinct background flavor. Dill is the perfect companion for rice, whether fluffed into pilaf or rolled into grape leaves. It lends tang to soups (especially with yogurt) and to pickled vegetables. Picked straight from the garden, it makes the freshest salad taste even fresher. My favorite memory of dill is in the Armenian cheese my mother used to knead from curd she'd bring home from the Middle Eastern store in Paterson, N.J. It was Mom's rich, salty cheese that taught me a lasting lesson about dill: The crucial difference between the feathery leaves, which are the herb, and the "seed," which is a spice. 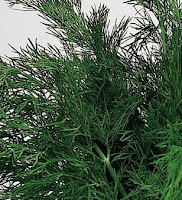 Dill weed works well in salads, vegetables, sauces, and meat and fish recipes. It's sold fresh, dried, whole or chopped. Because heat diminishes the flavor of dill weed, it should be added toward the end of the cooking process. Dill “seed” is actually the dried fruit of the dill plant. It's small, flat, and dark. It has a stronger flavor than the weed, and is commonly used in pickle brine (as in dill pickles), cabbage recipes, stews, and sauces. It is good to know the difference before you bring your dill home, especially if you're bringing it home to my mother. It was autumn, and I guess I was in junior high school at the time. My mother was in the kitchen making her delicious cheese. It was almost time to add the dried dill to the curd when she realized there wasn’t enough to complete the recipe. She called to my father, and asked him to hurry to the nearest grocery store to buy more. Dad took me with him. We got to the store, rushed inside to the herb-spice aisle, then stopped and stared. There were two different bottles marked “dill”- dill weed and dill seed. I asked my dad which one mom wanted. (This was long before cell phones!) He said, “Just pick one; she needs it now!” I grabbed a bottle, we paid, and rushed home. Unfortunately, I chose dill SEED instead of dill WEED. How was I supposed to know which one mom wanted? Mom had to make do with the tiny bit of dill weed she had. 1. In a 3-quart saucepan, heat about a quart of water to a gentle boil. 2.Cut curd into ¼ inch slices. Place slices, a few at a time, into the hot water until the slices become pliable. 3. Remove slices immediately to a plate. Lightly sprinkle each slice with salt and a little dill weed. Gently knead or fold each slice to combine the seasonings. 4. Continue the process with each slice of cheese. 5. Serve immediately with chorag, or your favorite bread. * Raw curd can be purchased at a specialty cheese shop, an Italian market, or Middle Eastern store. But call ahead; it may have to be ordered. If you can’t find raw curd, use fresh, unsalted mozzarella. Cut into slices and place them on a microwave-safe dish. Microwave for about 30 seconds on 50% power . Don’t over-do it, or the cheese will become tough. When the cheese has softened, sprinkle with a little salt and dill weed. Gently knead or fold as mentioned above. Almost as easy as buying ready-made curds or fresh mozzarella is making the curds at home. It's simple and delicious. This recipe is from Martha Stewart. I think it would work for this recipe. 1. Combine milk, heavy cream, and salt (if using) in a nonreactive heavy bottomed saucepan. Place saucepan over medium-high heat and bring to a boil. 2. Add lemon juice and continue to boil, stirring constantly until curds separate, about 1 minute. It may be necessary to adjust the heat to prevent cream from overflowing. 3. Pour into a very fine-mesh stainless steel strainer. Place strainer over a bowl that is deep enough for the strainer to sit over and not touch the liquid. Allow cheese to drain for 1 hour in the refrigerator. Discard liquid and transfer ricotta to a covered container. Refrigerate until ready to use, or up to 3 days.